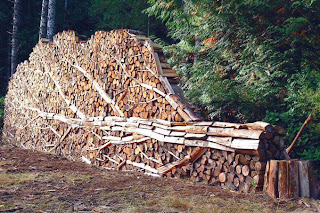 As late autumn is here, I took delivery of some firewood for the cold, drafty city house. I buy the wood from a man in-state, who maneuvers his truck down my street here in the old section of the city. 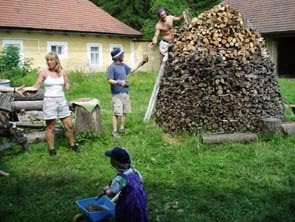 Once at our door, we throw the wood into the courtyard garden, I pay him, he drives off, and I spend the next hour or two stacking the wood. I have endured endless lectures from older family members about the proper ways to stack firewood, and have split more cords of wood with a maul than I can remember... all of which I think fondly. 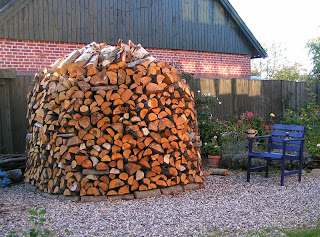 Because the courtyard is small, and I took a full cord of hardwood (white and black birch, cherry, and hickory), I wanted to stack it well and efficiently. Traditional log racks only hold about 50 or so logs, and do not do the trick for me. 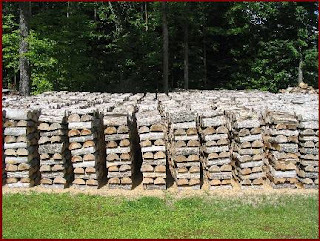 I knew that a cross-stack or two would come into the picture, and since I would be using a brick wall as the back and as one end, I could pile the rest between the wall and a tall-but-steady cross-stack. Out of curiosity, I checked online for some creative stacking photos, and found the following. Stunning. The axe (not splitting maul) in the stump completes the sculpture, as if it were just felled. Below, haystack-style piles are still impressive. 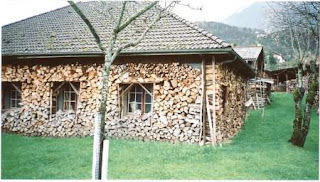 In France, a house with a large over-hanging roof creates a nice shelter for the firewood, against the house walls. Notice the temporary boxes around the windows. The picture below shows a very tight and efficient cross-stack, though if you have children, they must stay out of the tempting labyrinth of stacks. In the end, I realized that my son might try to climb the stack, so I put in some flying buttresses of wood stacks to hold the thing against the brick, and worked in a few courses of small rounds. A few years ago, I took delivery of all unsplit birch, and spent the winter swinging the maul myself, but the neighbors made it clear that the "hobby" was unsuitable for the city. As I write this, a birch fire roars, the Brandy tastes wonderful, the slippers are comfortable, and the wood is safely stacked outside, and yes Father, the wood is stacked bark-side up. I had thought about making this an extensive post, as there is limitless non-sense of which I am capable. I was in the airport recently, and came to a realization about the collar. It's really all you have. Cuffs peak out from the jacket sleeve from time to time, usually during fabricated descriptions of various measurements or when being sworn in at one's indictment proceedings... but the collar is what is seen of the shirt when one is dressed well. It really is just a few square inches, and that's all you have. In America, we give it woefully poor treatment and afterthought at most, preferring to leave the decision to shirtmakers who do the same. I will not spend much time on the button-down collar, and let me say that it is far less formal than the rest, but there is nothing wrong with it, so long as it is used appropriately. I won't make this a thorough examination, either, but will instead give the bare essentials of how to think about it and approach it. Cut it out, cut it away, spread it it out. The Europeans have shown that the old "your collar shape should depend on your face" thing is not as firm as you might suspect. After speaking with almost a hundred shirtmakers, I have come to the conclusion that unless the collar is buttoned down, it should, at a minimum, be spread. I would call a spread collar anything that produces a collar gap of 90 degrees to a little more. Beyond that, I would call the others cut-away. Politicians prefer the formless collars, in pointy, floppy, plain form. 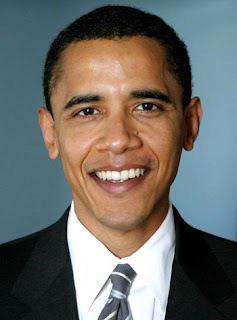 Here, our President wears the same collar that all pols seem to be required to wear. I hear about all of these guys having "tailors", but their boxy toga-suits and generic ties and collars suggest that several people are laughing, though for different reasons. 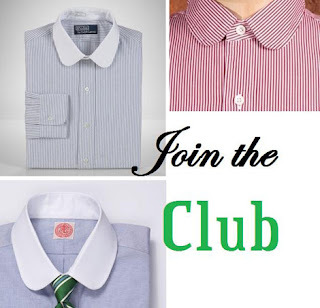 A spread collar is the bare-minimum, as far as the eye is concerned. Below, the angle pleases the eye, and adds a level of can't-put-your-finger-on-it elegance. As the collar spreads further, the interest increases. When it starts to go around to the back of the neck, we must proceed with caution. The extreme cut-aways are attention-getting, and people will certainly be able to put their fingers on it. 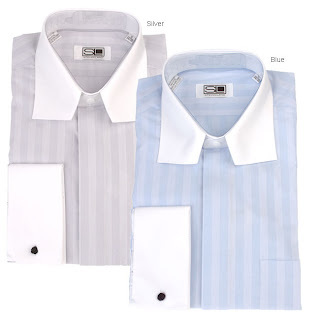 They look great with coat and tie, but are a bit too steep for many business settings. As far as wearing them socially though... they are unbeatable. 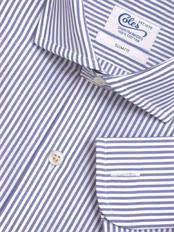 A certain friend of mine (who chairs a certain committee, at a certain club) had appeared in a collar that shows as a straight line from the front (see the Bengal-stripe collar two photos up), and when I complimented him, he told me that it was "some cheap Brooks Brothers shirt" he had picked up. Perhaps it did, in fact, cost less than most, but the collar was particularly nice, making it a wonderful shirt. It also just happened to look dashing with a tie. 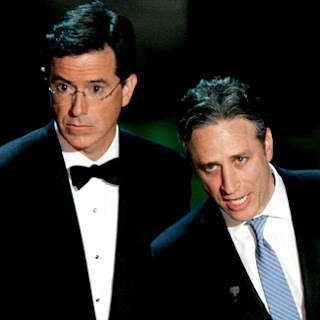 Two famous contemporary television personalities, can occasionally be seen in both spread and cutaway collars, and though the effect is subtle (the collars match the body of the shirts), it is still pleasant to the eye. They're really not even funny. These would only be impressive if your shirt maker handed them to you, and said "I'll finish the collars once I take your facial measurements", treating them like unhemmed pants. The other collar on it's way back (somewhat) is the "club" collar. They are certainly a less serious collar than others, but interesting still. Generally, there are a few rules that remain as constant. (1) The more spread, the more pleasing to the eye (and not just on thin-people). (2) A white collar is always more formal. (3) Cut-aways will start to get specifically noticed, while spreads will add a general attractiveness to the shirt. (4) A collar will appear just as it fits. If too tight, it will be obvious, and vice-versa. The tab collar is also a great way to add a bit of unexpected formality to the shirt (with a tie, of course), and if you know a decent shirt-maker, they can be retro-fitted on many shirts. Since so little of the collar is visible with a jacket or a sweater (cut-aways and spreads happen to look fantastic when tie-less and under a V-neck sweater), the collar should usually be the first consideration. Unfortunately, the supply of nice collars per shirts in the world is a sliver on a sliver, and you will have to wait, pay, or get lucky. My favorite Zodiac sign is "Attach Outboard Engine Here". The only fashion for which I've ever shown talent is Bristol Fashion.